While the world was devastated by the fate of our favorite Stark characters in the Red Wedding, I was eagerly waiting for the release of this season's soundtrack. 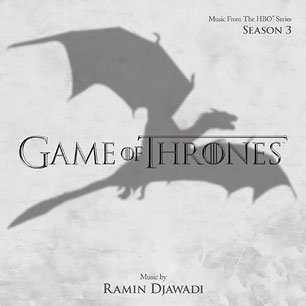 Game of Thrones Season 3 (Music from the HBO Series) was released today, June 4, 2013. This 19-track album that compiles some of the most choicest songs from the TV series is composed by Ramin Djawadi, same composer who brought us the sometimes lively and sometimes heart-wrenching scores from the previous two seasons, as well as the scores in Iron Man, Prison Break and Person of Interest. Check out the details of Game of Thrones Season 3 (Music from the HBO Series). While you're at it why not listen to this guitar rendition of the iconic Game of Thrones opening theme , this time entitled For The Realm.